Ripper Street debuts tonight on BBC America at 9 p.m. Eastern. Some shows are hard to describe. Maybe a creator is trying a new approach; maybe it’s a story about a person or a world we don’t often see on television; maybe the appeals and flaws are ethereal, fleeting, difficult to pin down. 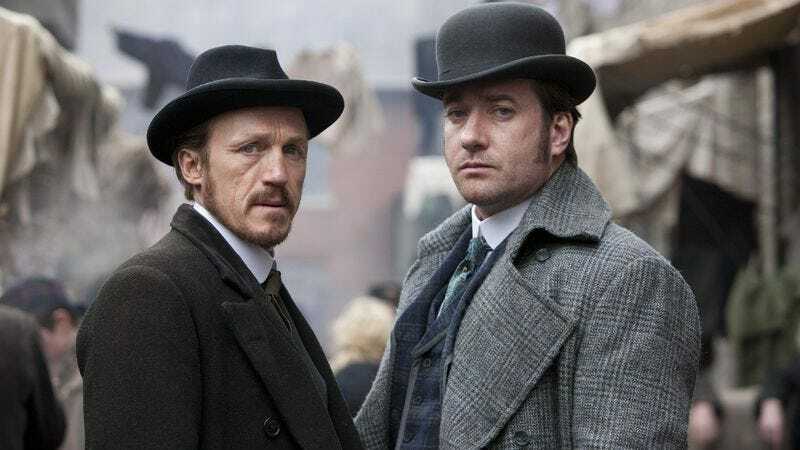 Then you have a show like Ripper Street, which is not hard to describe in any way. It’s a police procedural, set in late 19th century London. That is the heart of the matter. There are various wrinkles and nuances to the concept, but if that description appeals to you, there’s a reasonable chance you’ll enjoy the show. Which is cool, really; competence is underrated in art, and a series that pretty much delivers exactly in the way you’d expect it to deliver is nothing to sneeze at. On the other hand, if that description leaves you cold, there’s little in these first two episodes to change your mind. Performances range from good to adequate, the mysteries are all right, the dialogue entertainingly old fashion. (Every line goes on a little longer than it needs to, as if all the actors are paid by the word.) There’s even some interesting thematic ideas tossed about, especially in “I Need Light.” But there’s no spark to raise it to the level of a must-see. It’s a reliable drama which has possibilities lurking around the edges, but lacks the ambition to reach for them. Equivocation aside, the first episode opens in what has to be the most predictable way possible: a dead woman is found in Whitechapel, face mutilated, and almost immediately, Jack the Ripper’s name comes up. Only, the show is set in April of 1889, six months after the last documented Ripper killing. (Mary Jane Kelly, or, if you’re going by Alan Moore, someone who was not her.) It’s a fascinating idea. An infamous murderer has disappeared without ever being brought to justice. The hope is, he died or moved away or was sent to Bedlam once the Freemasons decided he’d exceeded his purview. But now a new body turns up, and even if the corpse’s mutilations don’t exactly fit Jack’s M.O., it’s close enough to get the rumors started, rumors that the authorities want to squelch as quickly as possible, while at the same time being unable to deny the fear that yes, the killer is back, and no, they still don’t know how to stop him. “I Need Light”’s other big strength is the way the story keeps coming back to the idea of progress, and how that progress is starting to affect the way police and criminals do their respective work. The script is never exactly subtle about it, but as some officers don’t understand the value of Jackson’s autopsies, or as the case moves from a potential Ripper killing to something different but equally unusual, involving the a brand new way to exploit the world’s oldest profession, there’s a sense of a world in flux; of the familiar Victorian signposts (between the streets full of urchins, the period costumes, the soot, and the accents, it’s all a bit like a Dickens theme park, which, come to think, wouldn’t be such a terrible idea) needing to make way for some unknown, and potentially terrifying, future. While this theme is less relevant in the next episode, it’s still part of the show’s DNA, along with the Jack the Ripper nod in the title—after all, what was Jack but a sort of lethal modernity made flesh, with his gory violence against women, ritualistic approach, sexual madness, and larger than life legend? The downside to all this is that, while there are some interesting ideas in Ripper Street, the show still lacks the spark to transform “interesting” into “thrilling.” There’s a thin line to between the two, to be sure, and as mentioned, anyone with a soft spot for the historical era and/or the rhythms of the cop show will most likely enjoy themselves. But there’s something very stolid about the show, in a way that keeps undercutting the lurid mysteries without offering any substantial depth in return. Reid is largely humorless, and the world around him seems to follow his lead. Even Jackson, who seems to be going for a sort of Doc Holliday without the tuberculosis vibe, isn’t having much fun (which is sad to say, considering he’s introduced going down on a whore). There’s something laborious to the series, a sense of basic craft which makes it watchable while at the same preventing it from gripping the imagination. (Given the direction “I Need A Light” heads in, that’s sort of surprising.) Episode two is a bit more loose, but it’s not quite there yet. In the end, the best and the worst thing you can say is that this wouldn’t be out of place on CBS—old school to the core, but without the characters or the charm to get full value for the years.